World War Two through the eyes of a British middle class family, Mrs. Miniver eloquently captures the resiliency of civilians in the face of adversity. 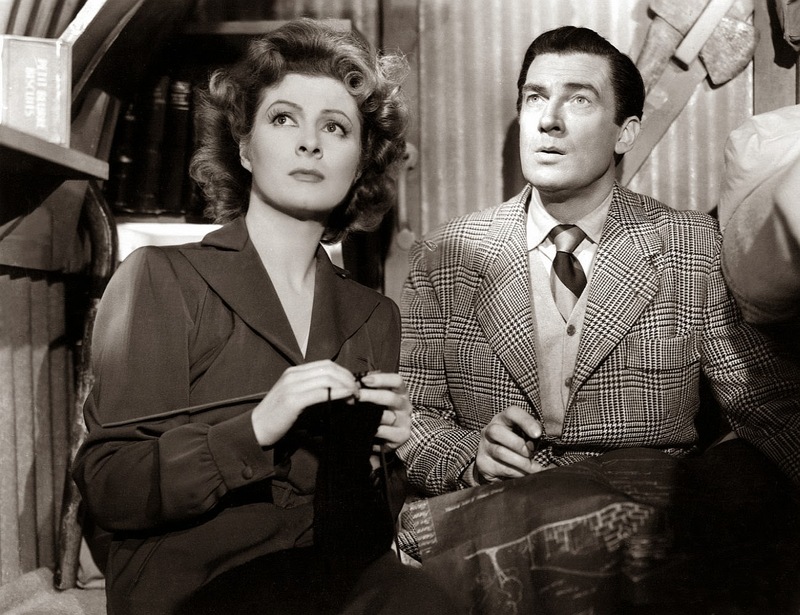 Kay Miniver (Greer Garson) lives with her architect husband Clem (Walter Pidgeon) in the fictional village of Belham, a suburb of London. With the winds of war blowing across Europe, the Minivers carry on a normal suburban life, looking after their two young children Toby and Judy while eldest son Vin (Richard Ney) attends college. When Vin comes home for a visit, he starts a relationship with local girl-next-door Carol Beldon (Teresa Wright), the granddaughter of the haughty Lady Beldon (Dame May Whitty). Britain finally declares war on Germany. Vin joins the Royal Air Force, while Clem helps to organize local civil defence efforts. When the Battle Of Britain erupts Kay and Clem have to spend long nights in their front yard cramped underground shelter, comforting Toby and Judy, listening to the continuous sounds of air raids, bombs, and anti-aircraft guns. Clem is recruited to help in the Dunkirk evacuation, news from Vin is often patchy, and Kay has a harrowing encounter with an unexpected visitor. Still life goes on, the romance between Vin and Carol becomes ever more serious, and Lady Beldon is unhappy to be challenged at the local gardening competition. The war eventually arrives at Belham's doorstep, and the Minivers are not spared their share of carnage. Conceived as an inspirational film to bring home to an American audience the suffering of the British, Mrs. Miniver started filming before the US joined the war but was released after Pearl Harbour. The film became a rallying call and a symbol of the civilian war experience, families and communities coming together to stand up to a common enemy and support their fighting men. It is also a heartfelt portrait of war's ripple effects on civilians far from the front lines. A film about war but without any battle scenes, Mrs. Miniver's appeal lies in its astounding normalcy. Director William Wyler takes his time and dedicates the first 30 minutes to life before the war. Kay and Clem are portrayed as a loving but quite ordinary middle class couple, occupied by work, shopping, over-spending, and dealing with the challenges of their children and neighbours. The Minivers are no heroes, but they will need to act heroically when their life is disrupted by a global conflict, and their heroism lies largely in carrying on with life as best as possible. When death becomes a daily possibility, the war heightens the importance of emotional attachments, as the family gets tightly packed into the confined shelter, and the romance between Vin and Carol gets condensed into a hurried courtship and accelerated talk of marriage. Ironically the war makes the family stronger and more resilient, decisions are made quickly and every moment is enjoyed and celebrated with a mixture of defiance and pathos. And Wyler gradually brings the strands of society together into a stronger whole. Working class, middle class and upper class come together to create a united home front, the gardening show providing a metaphor not just for life carrying on, but for the blurring of previously divisive lines as a country unites against a common enemy. Mrs. Miniver deservedly scooped six Academy Awards, including Best Film, Best Director, Best Actress for Garson, and Best Supporting Actress for Wright. It has stood the test of time, and remains a moving portrayal of what it means to Keep Calm and Carry On.